MacVector’s Import Features tool allows you to import annotation from many Genome Browsers (e.g. Ensemble, UCSC, etc). MacVector can annotate an empty or annotated sequence. GFF, GTF, GFF3 & BED files are all file formats that are used to store annotation (features) generally without containing any sequence. Although it is common that they will be accompanied by a fasta file containing the sequence only. They emerged as a way of exporting, or exchanging, information from a specified region of an entire genome without having to take the entire genome. Most sequence formats were developed to be for a specific gene or protein. Although this is no longer true they are still orientated to be of a region of fixed length. These annotation files are not at all length specific and could potentially store just two features that were at either end of the same chromosome. They are a much more flexible way of dealing with annotation, especially a large amount, than a fixed length sequence format such as Genbank. They also are not limited to a single sequence and can contain information from multiple sequences in the same file (Fasta files can also contain multiple sequences). For example you could store the entire human set of chromosomes in a pair of (quite large!) files. A multiple sequence Fasta file and a single GFF file. Sequence ID is the sequence these annotations belong to. These tools (generally online web gateways) allow you to browse the entire chromosome or genome of a particular organism. Almost like a graphical model of a sequence database. All the information known about that particular organism’s sequence that has been submitted to one of the large sequence databases (e.g. Genbank at the NCBI) should be visualised within the genome browser. You can download all the annotation contained within a particular region fairly easily using one of these annotation formats. Then you can either annotate an existing file that you are working with (so preserving your own “private” annotation with all known public annotation). Click on this link to open the UCSC’s Genome Browser. Select C.elegans (or click the link to “worm”) and enter sel-12 in the gene name. Click SUBMIT. This will now allow you to export all the annotation associated with the previous displayed region (tracks). Change the REGION to POSITION. 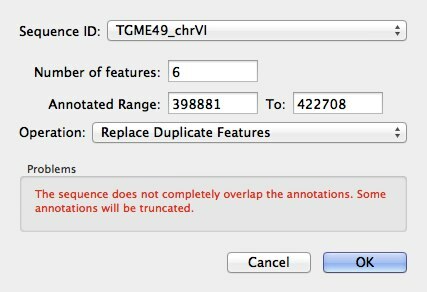 Now you need to open the sequence you want to annotate. For this example we could go to DATABASE > ENTREZ and search for and download Accession Number U35660. However, that only contains the mRNA and not the genomic sequence. So instead download the fasta sequence from the NCBISequence : Chromosome: X; NC_003284.7 (915873..918235)You will need to ensure that the start position of the downloaded file corresponds to the start of the region of the chromosome we have just downloaded the annotation for. This is easily done in MacVector. Now we will import our downloaded annotation. The Sequence ID (SeqID) contained within all features in the file will be shown in a dialog along with the number of features for each SeqID and the region of the sequence that these will be annotated against. A warning will be displayed if any of the features are outside of the region to be annotated. A dialogue will be shown with the number of annotations that have been added. If you annotate a blank sequence (e.g. a fasta file) the resulting features may be initially hidden. However, you can easily show them from the Graphics Palette tree view.You can choose to annotate your sequence with all the features contained within the imported file or to ignore duplicates. For this workflow we’ll start with a “random” 2kbp sequence from TaxoDB as a “starter” empty sequence. Blast the above sequence using the Blast interface at Toxodb.org. Click on the link to open it in the ToxoDB Genome Browser. Select DOWNLOAD TRACKS, then CONFIGURE and change it to GFF3 format and SAVE TO DISK. Now click GO.This downloads a file “dumped_region” which will contain all the annotation stored in the ToxoDB Genome Browser in GFF3 format. Now switch back to MacVector and open the 2Kbp sequence. Change the start coordinate of the sequence to match its location in the genome (which is 405235 as detailed on the Blast hit page) as in the step in the previous workflow. I then went to FILE > IMPORT FEATURES and selected the GFF3 file. The dialogue will show that it has found 6 features. Note that the GFF3 file contains annotation from a much longer sequence than our initial query sequence. MacVector will ignore any annotations that lies outside the query sequence. It will show an warning message to indicate this. 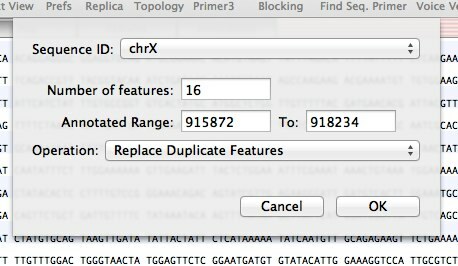 You will be able to “update” and add new annotation to your existing sequence. For example after a few months I could revisit these two genome browsers website and download an updated GFF3 file. Upon importing these features it will optionally replace any duplicate features and add new ones. So you can work with a sequence and also keep it updated as other researchers find more about this particular sequence. Due to the lack of strict standards across the many different file formats it may be that a potential duplicate is not recognised as such because the wording or keyword is different. 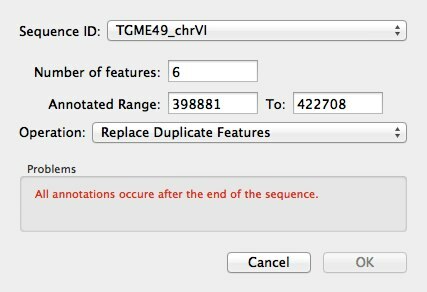 In the majority of cases some degree of manual curation of the annotated sequence will be required. In all cases MacVector will err on the side of caution and will never throw away any potentially interesting or important information contained within a feature. Only entries that are 100% the same (after being parsed during the import) will be considered as duplicates. MacVector will never class a feature as a duplicate if the START, STOP or FEATURE TYPE are different in any way. Even if they differ by just a single base. This entry was posted in General, Releases, Techniques, Tutorials and tagged annotation, tutorials. Bookmark the permalink. Both comments and trackbacks are currently closed. I am having difficulty uploading a custom UCSC genomce browser track imported into MacVector 10.6. Can MacV accomodate tracks that consist of ChIP quantitative data, or will it only represent a flat feature? We do this for compatibility reasons and to avoid “data lockout”. A MacVector file can always be exported to a 100% compatible Genbank file. However, I will add this to our enhancement request database.